Weighing in at just under 9 lbs., this sleek, easily-transported and affordable compressor performs well and looks great doing it. Use the compressor in auto start/stop mode and it runs only when you press the trigger on your airbrush. 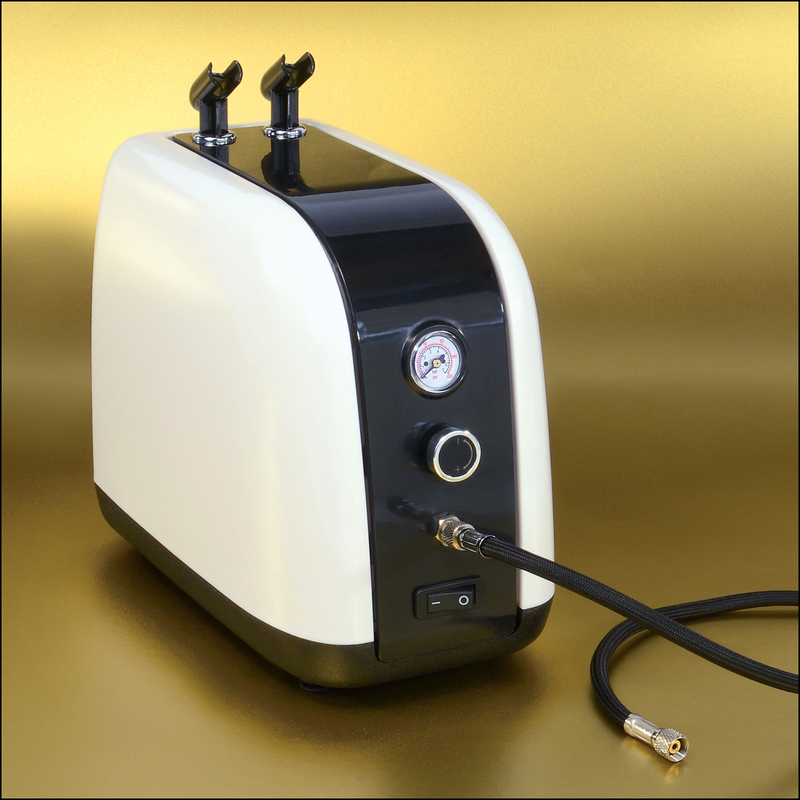 Or, use the built-in pressure gauge to dial-in the optimal pressure you need (anywhere from 5 to 57 psi) for spraying your choice of media with a continuous, controlled flow. * Either way, its oil-less, maintenance-free, piston-type construction provides smooth operation with very low noise, and its internal tank with water drain valve provides dry, pulse-free air flow. Motor: 1/6 hp., 120v AC with five foot cord; body-mounted master on/off switch. Includes airbrush holders, convenient carry handle and sound-deadening feet. Outlet fitting: 1/8 inch BSP male plus 6' long braided air hose with 1/8 inch BSP female/female fittings. Includes adapter to convert output to 1/4 inch male fitting. Overall size: 10 inches deep x 5-1/2 inches wide x 8 inches high. Air output: up to 0.81 cfm. Delivers up to 57 psi. MicroLux® brand. *Auto start/stop mode is only active when the built-in pressure gauge is turned all the way to "+." When using the pressure gauge, it is normal to hear and feel air escaping from the compressor and for the compressor to run continuously; this is how the unit maintains constant airflow at a consistent pressure.